WE ARE PLEASED TO PRESENT THE SACRAMENTO REGION PREMIER OF THIS AWARD WINNING FILM! Matinee screening 2 pm – 3:30 pm. 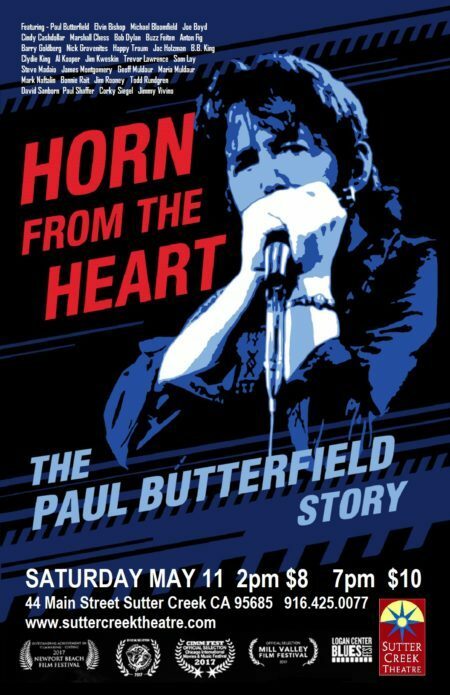 HORN FROM THE HEART: The Paul Butterfield Story is a feature-length documentary about the life and career of legendary blues musician Paul Butterfield. A white, teen-age harmonica player from Chicago’s south side, Paul learned the blues from the original black masters performing nightly in his own back yard. Muddy Waters was Paul’s mentor and lifelong friend, happy to share his wisdom and expertise with such a gifted young acolyte. The interracial Paul Butterfield Blues Band, featuring the twin guitar sound of Michael Bloomfield and Elvin Bishop, the rhythm section of Sam Lay and Jerome Arnold and the keyboards of Mark Naftalin, added a rock edge to the Chicago blues, bringing an authenticity to its sound that struck a chord with the vast white rock audience and rejuvenated worldwide interest in the blues. The band’s first LP, The Paul Butterfield Blues Band released on Elektra Records in 1965, was named “#11 Blues Album of All Time” by Downbeat. The only artist to perform at The Newport Folk Festival in 1965, The Monterey Pop Festival in 1967 and Woodstock in 1969, Paul would continue to break new ground in the blues and to stand up for racial equality until his death at age 44 in 1987 of a drug overdose. Through his music and words, along with first-hand accounts of his family, his bandmates and those closest to him, HORN FROM THE HEART: The Paul Butterfield Story tells the complex story of a man many call the greatest harmonica player of all time. The Paul Butterfield Blues Band was inducted into The Rock and Roll Hall of Fame in 2015.